In 2013, my husband and I made the New Year's Resolution to try a restaurant in the L.A. area that we'd never been to before at least once a month. It didn't count if we were traveling and eating at different restaurants; it had to be in the L.A. area. Well, we succeeded, and we're carrying the resolution over to 2014. It helps us have a guaranteed date night at least once a month, and with this food blog, it's great to have new restaurants to write about. I must say that this resolution may sound like fun but is actually really difficult for us each month. We've found more restaurants we didn't like than did like, so it's kind of frustrating. Our standards are pretty high for food quality since we both like to cook, and when I go to a restaurant I want the food to be better than what I can make myself. Like I said; high standards. For that reason, we actually deliberately stay away from making certain types of food (like a lot of Indian and Mexican food) because we want to have something we can eat where we won't be thinking "This would be so much better if I made it myself and added this to it or did this differently." 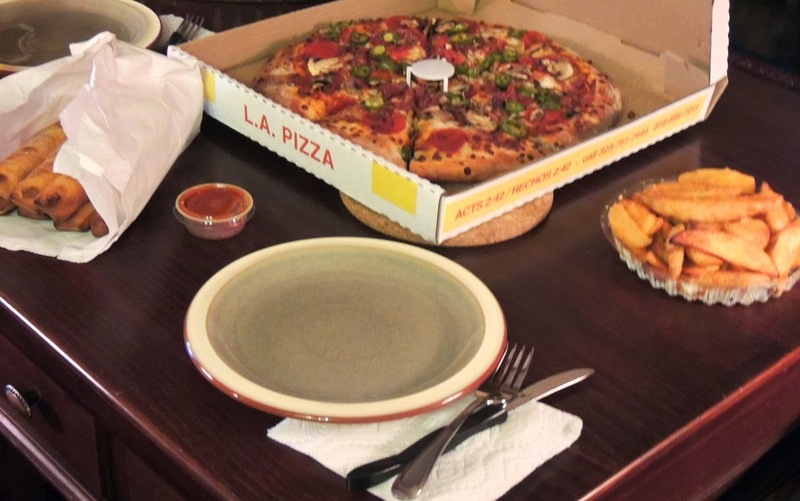 This post is about the last restaurant we tried in 2013, L.A. Pizza. I figure a take-out pizza place counts as a "restaurant." Our go-to is usually Little Caesar's for their Hot & Ready $5 pizza deal. I really love how simple and awesome their pizza is. We usually eat it while watching The Biggest Loser, just to be ironic. We have a bunch of Restaurant.com vouchers we need to use, so I was looking for nearby restaurants that took the vouchers, and L.A. Pizza was one of them. 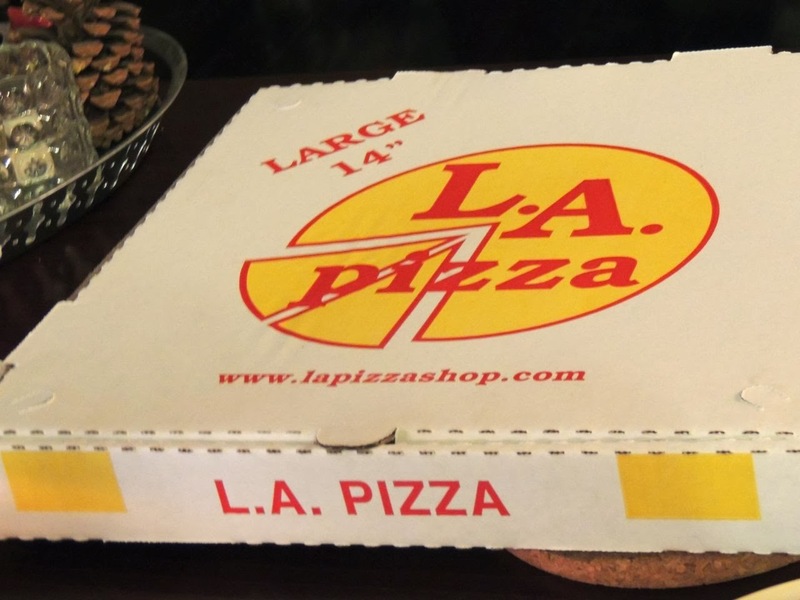 At the L.A. Pizza in Van Nuys, you have to use a $10 voucher and spend at least $15 (so $5 cash). We decided to order a large pizza topped with pepperoni, bacon, mushrooms and jalapenos. The online menu listed carne asada as an available topping, but when we called to place the order, they said they no longer have it. That was disappointing. I'd never had carne asada on a pizza before and thought it'd be fun to try. They should really update their website. This wasn't the only discrepancy we found. The prices on the website are also inaccurate, and so are the pizza sizes. We were going to order an XL pizza, but they only have Large or Mega. We went with Large. It's fine; I just wish the info online were accurate. 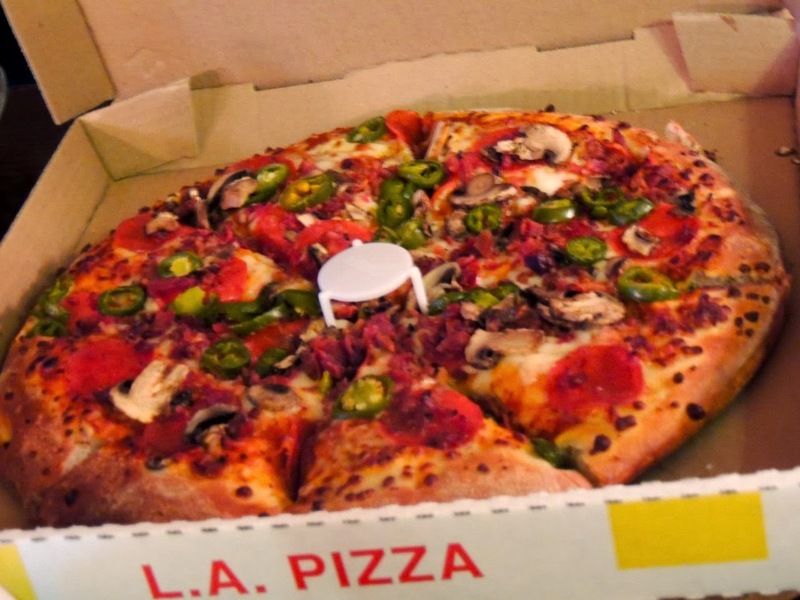 If you're reading this, L.A. Pizza, update your website! Actually, at the time of this review, I just tried to go to their website, lapizzashop.com, and ended up at a GoDadday page, so if you're reading this, L.A. Pizza, go renew your domain and then update your website! If you need help, I can do basic website stuff. Okay, so we ordered a Large Pizza, an order of breadsticks and potato wedges. The total came to $16.25, $10 of which was paid for with our free Restaurant.com voucher and $6.25 was cash. So, considering we really only paid $6.25, it was cheaper than our usual Little Caesar's order of one $5 pizza and crazy bread, which costs $7.62. It wasn't "Hot & Ready", but they said it'd be ready in 10 minutes, so my husband headed out the door to pick it up. We've waited longer than 10 minutes at Little Caesar's before for Hot & "Ready" pizza. Here are my positive thoughts about the pizza. It was a decent size for a large, about the same size as a Little Caesar's Pizza. However, instead of just pepperoni on it (what we get for $5 at Little Caesar's), it had multiple toppings, and the bacon was amazing (but really, bacon is always amazing). Also, the crust was a lot thicker than I expected. It was like a pan pizza instead of a hand-tossed pizza. It had to be about an inch thick. That can be a positive or negative depending on your preference, but it was a nice unexpected change from what we usually eat. 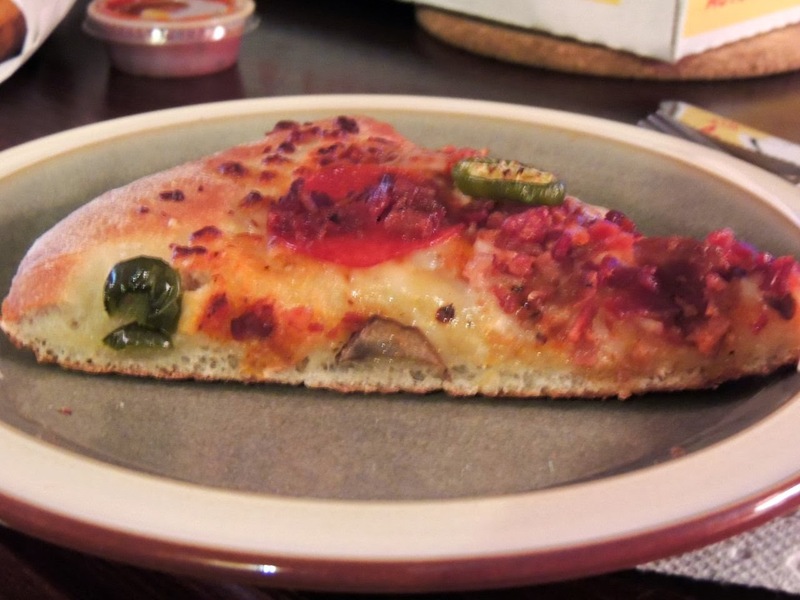 It reminded me of the thickness of a pan pizza at Pizza Hut, but it wasn't saturated in grease like a Pizza Hut pizza. It was drier, and I mean that in a good way. Here are my negative thoughts about the pizza. It could've used more cheese. I usually eat my entire piece of pizza, the crust at the rim and all, but this didn't have enough cheese for that, and the crust without cheese tasted too bland to eat. Also, the toppings weren't spread evenly on top of the crust. For example, some pieces hardly had any jalapenos on them and others had a ton of jalapenos. Jalapenos are spicy; I don't want a ton of them (or more than one) per bite. 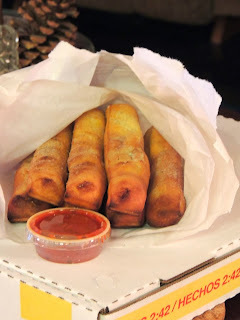 The breadsticks looked a little overcooked, but they were actually really soft, and they came with a marinara dipping sauce. I didn't use the sauce, but my husband did. He said it was fine. It's wasn't amazing, but it's pretty much what you'd expect. The breadsticks were loaded with garlic salt on top. I like salt, but it was a little much even for me. We still finished them, but I think I favor the Crazy Bread at Little Caesar's. The potato wedges were basically just fried potato wedges. They tasted really good, a little greasy but not too much. 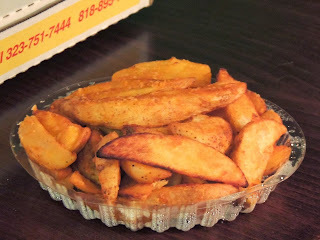 I don't think I'd ever gotten fried potatoes from a pizza place before, so I don't really have anything to compare it to. We finished those as well. It was way too much food, but it was so good it was hard to stop eating. We'll probably get pizza there again to use the Restaurant.com vouchers, but next time I'll order extra cheese and no jalapenos.